Priced well below her $284,000.00 survey value. Survey from May 2018 available to serious buyers. Classic great looks with the legendary ride, great sea boat in any type of weather, Captained maintained, Boat is ready to go catch the big ones now. Call and be on the water tomorrow. United Yacht Sales New Jersey would love to guide you through a personal showing of this 47' Buddy Davis 47 1989. 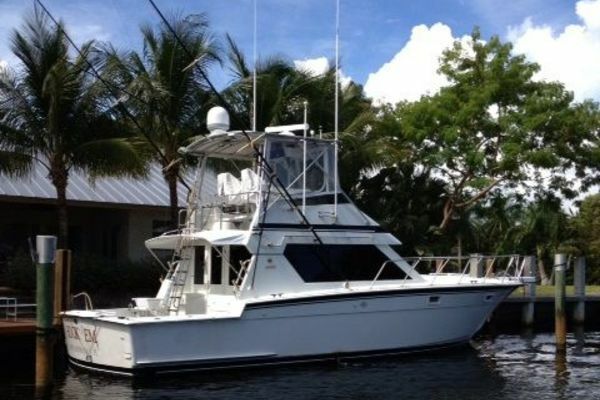 This yacht for sale is located in Destin, Florida and priced at $196,000. For a showing please contact us by filling out the form on this page and we will get back to you shortly! Sliding doors from huge cockpit lead to the warm teak interior offering a roomy salon with two sofas, and a dinette. There is a custom pine table with storage and teak fiddle rail. There is an entertainment center featuring a Samsung flat screen TV and a Sony surround sound system, including a Sony DVD Player and Satellite TV. Companionway leads down to guest stateroom to port with twin berths and a guest head with shower opposite. The master stateroom is amidship with a queen berth with storage under, two hanging lockers, a FLAT SCREEN TV, DVD, and Stereo Extra ventilation is provided by a hatch and screen. The master head is forward with vanity, sink, shower and electric head. A Set of TWO NEW Garmin 5212 GPSMaps handle the Radar, GPS, Chartplotter, Fishfinder with Chirp Technology , and Satellite XM radio duties. This is a great opportunity to own a classic Buddy Davis that is ready to go.